1. Combine the bean sprouts, spring onions and carrot in a bowl. 3. Add the white vinegar, sugar, salt and water. 4. Simmer over low flame for a minute. 5. Stir well till the sugar has dissolved. 7. Once cooled, pour this over the vegetables and mix well. 8. Keep the bowl aside for 1 to 2 hours. 9. Drain excess water before serving. 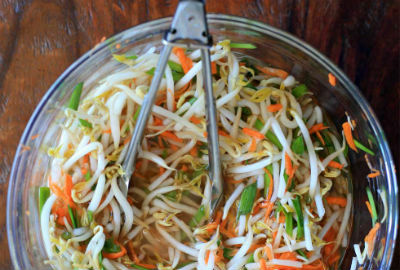 Feel free to comment or share your thoughts on this Pickled Bean Sprouts and Carrot Recipe from Awesome Cuisine.